Boelte Hall, the company who prints our patterns has this one now. It will be ready for shipping at the end of the week. We have used the same printer now for about 11 years. I don't think I would change printers at this point even if another company offered to print our patterns for free. The people working there are friends. They go out of their way to get our jobs done quickly.....when I walk in the door, they already know I wanted the print job done yesterday. And they never grumble or complain. "Happy Birthday" is Barb's design. She put both of our initials on this one. We were both born in the same year.....but I'm the older one. (darn it anyway!) She thought the "happy birthday dear friend" greeting could be changed if you wanted. It could read "Welcome new one", or "Happy anniversary", or even "I like you best!". Whatever suites your occasion. We are releasing this small "Reward of Merit" pattern at the same time. Barb added her mother's initials to this one. In 1942 her mother graduated from high school. I love the way the initials and date are stitched into the border. 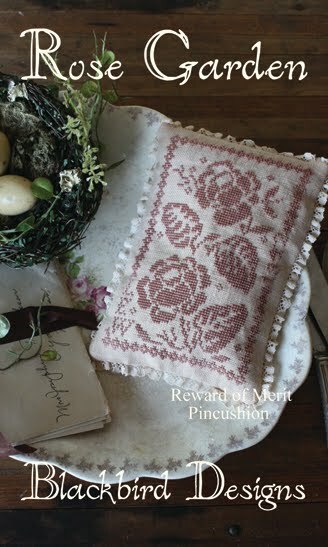 Our "Reward of Merit" patterns are packaged in 4" x6" plastic bags. We thought they would be something easy to pick up and quick to stitch. These should be in the shops by the end of next week. Here's a sneak peek at our project. Until later.....I'm off to work on kits again. Love it!!! I can't wait to get it! lovely, lovely patterns as ever - and the needlebook in the last photo is just stunning!! Prepare to be amazed. The Silver Needle is astounding! Does the Reward of Merit have the chart printed on separate paper from the card with the picture on it? I've always wondered why so many designers use plastic bags to hold a chart, since it's so unfriendly to the environment. Will stitchers pay more for charts in bags? Personally I love my plastic bags and I reuse them :-). Love the new AotH chart!!!! And funny note, Karin and I were born in the same year too so I will use this block for us. Love the little Reward piece too, I've already emailed my shop owner to tell her I must have it, LOL. Love the latest addition to the series and can't wait to add it to my collection! you are such clever girls!!! This almost makes me want to cross stitch...almost...just saying..
OooObaaa dooobaaa! That is some exciting new stuff!!!!!!! My heart is racing and my stomach is jumping. Wahhoooo! Love your patterns so much!!!! I got the quilt book, Country Inn, for my Mom's birthday a month ahead of time just so I could pour through it! She is a quilter and I am a stitcher. Sounds like you will have another wonderful weekend at the Silver Needle!!! Those gals are in for a wonderful time; just as we had at the weekend for Tomorrow's Heirloom's. I could stand to take a weekend with you two once a month!!!!!! OMG! I always love everything you ladies do, and all these projects are no exception. Just wonderful!! Can't wait till I get my copies of the pieces I can get. lol! Now how about teaching somewhere in the NY/NJ area?? Please? These new patterns are so gorgeous. My dream is to be at one of your classes. Won't you please come to Colorado and see the Rocky Mountains soon? The FanciMats and More shop is a favorite in Littleton--please, oh pretty please?!! All the pieces are gorgeous. I will be at your class on Saturday in Tulsa and I can't wait! Woohoo!! I can't wait to stitch this--I'm already thinking up ways to personalize it. Thanks! Wish I could join you for that class project! LOVE it! Beautiful new designs! 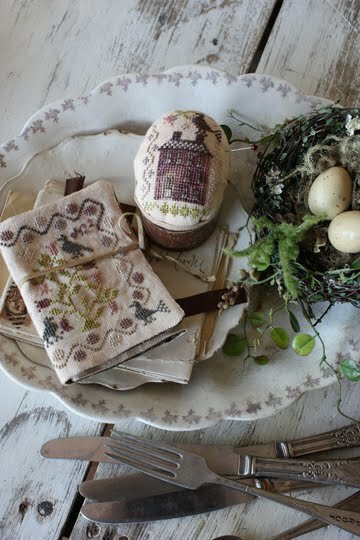 Love that Rose pincushion! Can't wait to meet you lovely ladies this weekend! MUST have Rose Garden...it is now on my wish list. I love it! My birthday is in this month and hopes to succeed makes this gift me! Oooooh yummy I want these so bad. Oh -- They just keep getting better and better. I can't wait to get my hands on them. And I really love the sneak peek at the class piece. I am so looking forward to another weekend with you and Barb. Hi Alma! Henry and I are waving at you from California! I'm jealous that I won't be doing this project. So pretty. I know your students will love it. Please come to the NY area. Please, please, please. LOVE the new designs. I can't wait until they are released. WOW!!!!!!!!!! Counting the hours until this weekend! You two are absolutely amazing -- you just keep the hits coming. Hey, you are going to love The Silver Needle. Wow. Absolutely love Happy Birthday. It's a must stitch. Love the new patterns and the projects for the Silver Needle! Can't wait for the book to come out with all the projects from classes. Have a good trip! I love the new designs!!! I cannot wait for the class this weekend at The Silver Needle. You will really enjoy the shop...tons of models. One question, what size q-snap/hoop would you recommend bringing to stitch the class piece with? See you in Tulsa!!! Hope you get there in time for a little side trip to Jenks!! Have fun in one of my favorite cities! What a lovely projects you've shown us! The newest Anniversaries of the Heart is gorgeous, and so is Rose Garden! Both of these will join my ever growing pile of stitching! 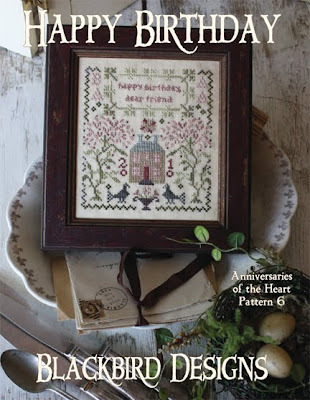 I am so glad I decided to stitch the Anniversaries of the Heart series. They really are beautiful designs! I'm still working on the first, Snow Garden, but I'm enjoying it very much and can't wait to move on to the next! Very lovely! It always makes me happy to visit your blog and see your beautiful work! Hello, wher can i buy this patters. I have seen the different finished "Souvenir de France" pieces on your blog and love them. I understand it was a free chart but I have gone back to the end of last year and haven't found it. Please let me know the date of the free chart; I would love to stitch this piece. I did stitch your "ABC" piece and loved it...such a quick, easy piece to do...and without magnification, which so many of my projects require. Many thanks for your inspiration...and the information about the free chart. Molto belli i vostri nuovi schemi! Attendo che arrivino presto nei nostri negozi e poi ne farò incetta. Complimenti. Love the Anniversary of the Heart Patterns. Just a quick question. A while ago you mentioned that you might consider releasing the first Bonus Pattern early. Is that still a possibility? I'm a little reluctant to try to save room for it. What if I stitch all of the next one and then find out that I've miscounted my threads? I'm at a crossroads. What do you think? Alma, I attended your event at The Silver Needle last weekend. You and Barb are extraordinary women and I am thankful to have had the opportunity to meet you both. I'll look forward to future designs. I love your quilt designs and cross stitch designs! I am working on a quilt from your "Quilting in the Garden" book now. It's inspiring to follow your blog...please keep up the wonderful work! Please enter me in the drawing for the Rhubarb & Ginger fabric line. Thanks for your exquisite work! Loved seeing the rhubarb & Ginger fabrics again. The sampler fabric has played a major role in one of my favorite quilts- Home Sweet Home which I am proud to say I've finished! Where the heck has time gone?